This week is the national Romance Writers of America conference so it’s fitting to announce the sale of Maggie Wells’s next contemporary romance novel, A BOLT FROM THE BLUE. Congratulations Maggie!! Author of A WILL AND A WAY Maggie Well’s A BOLT FROM THE BLUE, the third in her Worth The Wait series about a Chicago heiress and a blue color Chicago Bulls-loving hero, again to Martin Biro at Lyrical Press, for publication in 2017, by Sara Megibow of kt literary (World). 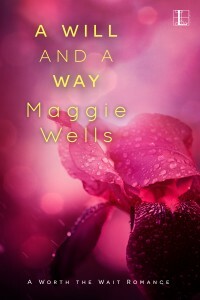 A BOLT FROM THE BLUE is Book #3 in Maggie’s A Worth The Wait series – read Book #1, THREE LITTLE WORDS and Book #2, A WILL AND A WAY which just released last week. Happy reading and enjoy! ← SOLD!! Congratulations to debut author Margaret Rogerson!